Noted as the handheld vacuum with the “Power of upright in your palm”, The Dirt Devil ‘The Hand Vac’ 2.0 SD12000 Handheld Vacuum is a little beast of a machine and one that lives up to its name. It encompasses a stylish red on black design, a wide mouth nozzle at 6.5 inches which holds a motor-driven high speed brushroll, making it superb for picking up various sized dirt and debris quickly. Effective At Cleaning Carpets & Upholstery: The motor-driven high speed brushroll continuously rotates, rolls and easily cleans up tough ground-in dirt and different sized debris, most effective on carpets and upholstery. Also Effective At Cleaning Pet Hair: The brushroll combined with the strong suction power makes it good for picking up pet hair also. Very Quiet: Unlike many other powerful handheld vacuums, the Dirt Devil The Hand Vac 2.0 is very quiet, which makes it suitable for cleaning at any time. Long Cord With Integrated Storage: It has a 20 foot long cord that can be wrapped around the base, which allows you to easily transport the vacuum around without unplugging it. Easy To Clean: It has a reusable quick rinse filter and one-touch emptying of the dirt container. The Dirt Devil ‘The Hand Vac 2.0’ holds impressive customer ratings on Amazon. Size comparison between the Eureka EasyClean 71B & Dirt Devil SD12000. 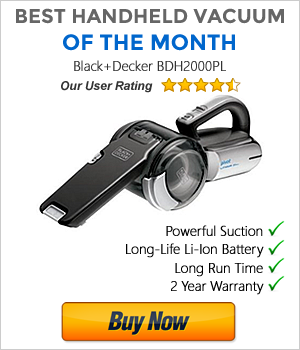 You need a powerful handheld vacuum that can easily clean carpets and upholstery. You want a handheld vacuum that can also pick up pet hair effectively. You want a quiet vacuum to be able to clean at any time whether during the day or night without disturbing others. The Dirt Devil ‘The Hand Vac’ 2.0 SD12000 Corded Handheld Vacuum is a stylish, compact and powerful device that can effectively clean almost anything. It’s one of Dirt Devil’s most recent models and it has made an impressive debut with consumers. The main complaint is that it doesn’t come with any attachments, but the emphasis for this vacuum is on cleaning carpeted and textile surfaces. At it’s very low price point, you cannot argue that you’re so much for your money, which makes it an instant favorite among consumers. 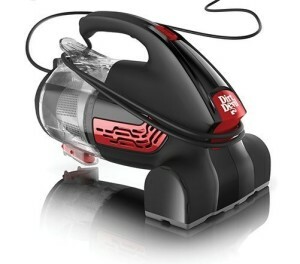 Check The Current Prices For The Dirt Devil The Hand Vac 2.0 SD12000 Handheld Vacuum Today!